I will start my first blog off saying how heartbroken our family was to hear of the tragic loss of a young lady at the age of 22 who lost her battle with ROHHAD this week, Sarah Blake. I had never spoken to her or her family, although I wish I had. She was a member of our support group but we had never corresponded. We send our love and prayers to her family. I’ve thought for some time what I would write about in this blog. I’m committed to helping raise awareness of ROHHAD but at the same time our family values our privacy. We don’t want this disease to define us or especially Reagann. It’s a balance that I haven’t quite figured out yet. I’ve said for some time that Reagann has ROHHAD but ROHHAD does not and will not have Reagann. This past weekend we went to a store about 50 miles away from home. A woman who worked in the store recognized Reagann and commented that she had seen Reagann on facebook. She was very nice and heartfelt. She recognized Reagann but she wouldn’t have been able to tell us anything about ROHHAD, but most people, including close family and friends, couldn’t really tell me much about the disease if I asked. How do I change that? The disease is SO complex, it takes us parents years to try to understand it and have any sort of grasp on it. But maybe that’s not the goal. My goal has always been to find others who could have the disease. I don’t ever want anyone to go through what I went through….begging doctors all over the country to listen to me that there was something wrong with my child. And for months, years even, no one would listen. It’s still hurtful nearly five years later to think of all I went through to try to get help for my child. The biggest question I get asked from people is “How is Reagann doing?” I never quite know how to answer this question so I usually just smile and say that she is doing great. It’s just easier to say that. If I tried to explain it all to someone who asked, it would take hours. I do not take Reagann’s health for granted, overall she is doing quite well, and I am very thankful. But every day truly is a battle. We have to watch and monitor everything Rea does. We keep spreadsheets of her daily fluid intake, oxygen levels, heart rate, etc. I keep a spreadsheet with all of these numbers on them, and track averages; so if her numbers are off trend or higher or lower than average it sticks out. I use a lot of the skills I’ve learned at my office to track everything Reagann. It would seem to most people that it’s a ton of work and hard to do, and I don’t minimize it, it is hard but it’s worth it. I can tell you anything Reagann usually by memory. I study, analyze and memorize numbers, spreadsheets, doctor notes, clinic notes, medical records to be able to help my child. Is it overwhelming? YES! But I do feel that it’s in her best interest? Absolutely. Our doctors actually request my files periodically. Reagann’s biggest battles these days are with her electrolytes, mainly her sodium levels. The last few months have been very hard with her sodium levels being elevated. Any sort of stress or sickness will affect her sodium levels and she shows no signs when her sodium is high or low. The only trigger is if we notice that she’s not drinking as much as normal or if we have to push her to meet her daily fluid goal. We are actually lucky in the fact that she is pretty much able to drink as much as she wants. We are not on a strict fluid regimen like some children are, Reagann has partial diabetes insipidus, which means that she has some working thirst mechanism, so basically her brain doesn’t tell her all the time to drink to keep her body hydrated, but it does tell her some of the time. If her thirst mechanism worked fully then her brain would know when she was getting dehydrated and signal her to drink more. Her current fluid goal is 50-60 ounces daily. When her sodium is over 150 we get a fluid goal from her pediatric endocrinologist. Her fluid goal is calculated on her weight. When her sodium is over 150, our fluid goal is typically around 90 ounces a day for 2-3 days and then we will have her re-checked . We are chasing more and more high sodiums in the last few months and we are unsure what the cause is…it could be because she’s gained a little weight; disease progression or a number of other things. I refuse to say it is disease progression. Reagann normally gets her sodium checked every two weeks. If she’s in the normal range (135-145) then we get a two week pass before re-checking, if she’s high, then we have fluid goals, and recheck every two days or so until she’s back in normal range. Some days are harder than other days. This life is a very complicated, often lonely, mis-understood life. When you have a child with a chronic health illness (you will NEVER hear me say terminal because I don’t and won’t believe or accept that) it seems that you will always be accused of trying to get attention. I wish people understood that most of us would give anything for our children to have normal lives….for us as parents to have normal lives. But until you live this life daily, you will never understand. You are on constant high alert, and live every day, every hour of your life trying to give your child as normal a life as possible. 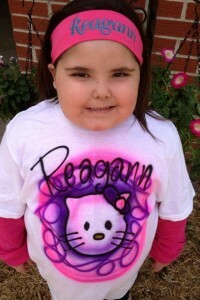 I’ll never stop fighting for and believing in Reagann. I’ll never give up. Reagann is a miracle and I praise God every day for what He has done in her life and in our lives. ROHHAD will truly not ever win with our family. Please continue to help all of the families that fight ROHHAD back, raise awareness of ROHHAD, and keep all the families and children in your thoughts and prayers. These truly are the most special people in the world. There’s a reason why our kids are 1 in 70 million.